The wait is over. 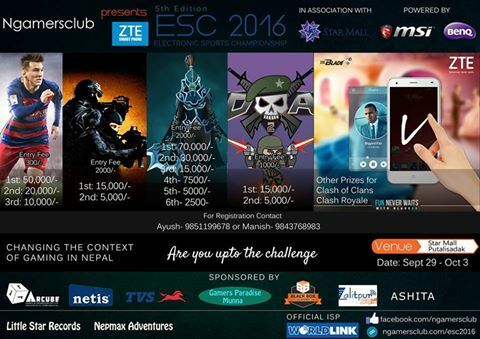 Nepal biggest E-sports tournament is here with very eye-catching prize pools. ESC 2016 consist of 6 Games which is Dota 2, CS:GO, Mini Militia, Clash of Clans, Clash Royale and Fifa 16. The tournament is going to be held in Kathmandu, Nepal at StarMall, Putalisadak. This championship is going to last for 5 days Sep 29 - Oct 3.